Where to find the queued broadcast and check the progress? We have couple broadcast not sending out with the status "Schedule queued, last run succeeded". I am just wondering where I can find the queue and remove the tasks? or check what's the progress of those queued broadcasts? Thanks for your prompt reply but I don’t think my question is answered. The highlighted items are the ones with the status “Schedule queued, last run succeeded”. Q1: What does that mean? What caused this? Q2: I assume it is similar to print queue. Something big is holding up the process and get everything in the queue not processed. If this is the case, where I can view the queue and “manage” the schedules? How to make those queued schedules coming through? I don’t want to delete, pause, or edit the schedule, I just want it to run as normal. -I have tried “run now” but nothing came through, I think I just added one more task to the queue. -I have refreshed schedule management, nothing changed. We are on 7.3 build 20170331. 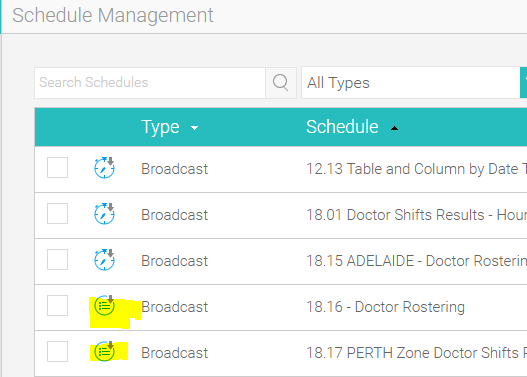 As we have many broadcast should be sent every morning, it would be great if you could advise how to troubleshoot this asap to keep the queued schedules in a manageable amount. Subject: New Comment in "Where to find the queued broadcast and check the progress?" Just wanted to let you know that this issue has been sorted out after we restarted the server. However I am still interested in knowing what caused this and how to troubleshoot this. The information in this email is intended for the named recipient only; it may contain privileged and confidential information. If you are not the intended recipient, you must not copy, distribute, take any action in reliance on it, or disclose any details of the contents of it to any other person. If you have received this email in error, please notify me immediately by return email or via the contact details above. Subject: RE: New Comment in "Where to find the queued broadcast and check the progress?" I am pleased all is well. Going forward with this if you can send me your YF Logs I can then look at the errors to see where the problem was. With this if you can also provide me with Time Stamps/Dates along with the Reports being sent for Broadcast this would help a lot. I look forward to your reply. I just want to touch base and question whether or not you need any further assistance with regards to this issue? I look forward to your reply. Just curious. Was the physical server restarted or just Tomcat. It would have been Tomcat not the actual box. If you are running into problems with schedules please let us know via a new private ticket and we can investigate.